Imitation may be the sincerest form of flattery for the Wilde at heart, but for the Weyes mind it’s a natural note in the songbook of life. 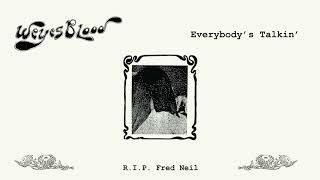 For the first recorded Weyes Blood music since her 2016 breakthrough album Front Row Seat To Earth, Natalie Mering shares A Certain Kind b/w Everybody’s Talkin’, a double a-side 7″ of cover songs close to her home but recognizable under any roof with a hearing heart at its hearth. 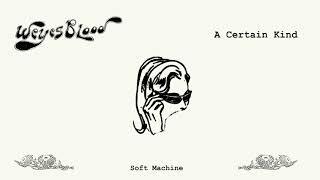 Originally recorded on distant shores from where midnight cowboys roamed the same year of 1968, Soft Machine’s “A Certain Kind” was often confused as a Weyes Blood original when Mering introduced the Robert Wyatt penned fusion ballad to her live set. A recording residency at the famed Galeria ze dos Bois (ZDB) multidisciplinary space in Lisbon, Portugal enabled Mering and her touring band to track the soul-searching rendition of the song present on A Certain Kind b/w Everybody’s Talkin’. A Certain Kind b/w Everybody’s Talkin’ is not only a capsule of Mering’s care for those artists and songs that have helped define the Weyes Blood sound, but also a discovery of a different kind — the words and melodies become Mering’s and ours through her intimate interpretation and commitment to seeking culture’s fringes for deeper meaning. Weyes Blood’s A Certain Kind b/w Everybody’s Talkin’ is available Thursday, September 7 on 7” and digital formats.